Layering is an important technique that should always be applied to any warm, cold or wet weather excursion. It sounds simple enough. Put on more layers of clothes when it gets cold and shed them when temperatures heat up.The fact is however, that this technique is only successful when you properly select the garments you’ll be using for your layering system. The first layer can be called the base or wicking layer, which is the closest clothing to your skin. A proper base layer should be able to absorb moisture from your skin and dry quickly. Many base layer articles of outdoor clothing are made from fabrics such as polyester, nylon, and polypropylene, but are also combined with engineered fabrics with various proprietary designs and names such as Omni-Dry™, Dryflo®, COOLMAX®, and more. These engineered fabrics improve the garment’s performance and comfort in both hot and cold climates. The color of your base layer is also just as important as the fabric its made from. Light colors are better for hotter environments as they reflect more of the sun’s heat. Dark colors absorb heat so they are more often used in colder conditions. The second layer should be one that provides warmth by means of insulation. This is a piece of apparel that is usually a sweater, vest, or long stretchy pants. 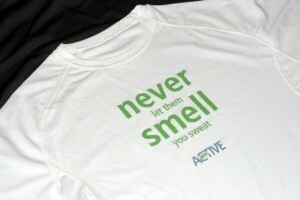 Your base layer should be a polyester T-shirt with moisture wicking and fast drying capabilities. 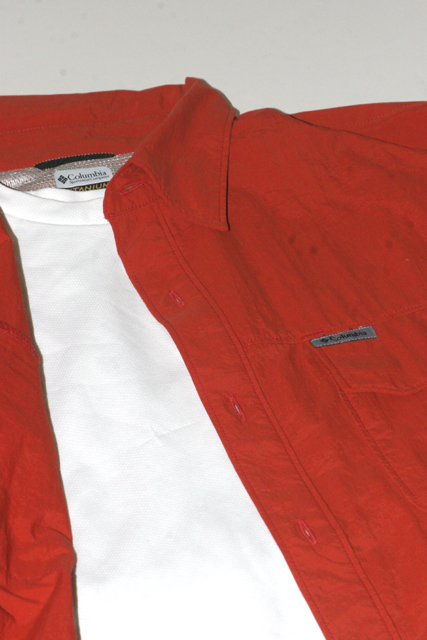 This particular shirt is also treated with an Agion anti-microbial to prevent odor. Choosing an insulator that is also breathable is probably one of your best choices, as it has the advantage of retaining your body heat and is fast drying. 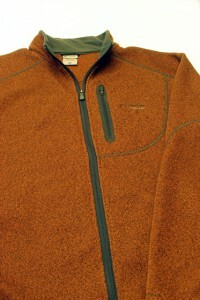 One of the most popular fabrics for this is fleece. Fleece is normally a combination of polyester, nylon, and Lycra materials but can also be made from recycled plastic bottles that are woven in combination with polyester fabrics. Fleece comes in various sizes, styles, and thickness and makes for an excellent insulation layer to your outdoor clothing. Because of this variety, its best to look for insulation layers that will optimize your type of outdoor activity. For example, climbers, trail-runners and mountain bikers use an thin insulation layer that conforms to the body and can stretch in all the right areas. Backpackers and mountaineers, typically look for thicker insulating layers for cold mountain trekking, but ones that are also lightweight and pack away easily. Other types of insulation layers are not necessarily as breathable as fleece for high activity, but are designed to retain and radiate body heat to keep you warm. These include everything from goose down feathers and wool, to woven polyester fibers and synthetic fabrics such as Thinsulate™, Loft, and others. Many of these materials are specifically designed to retain as much body heat as possible. The difference is in their ability to dry quickly. Down for example is an excellent insulator but once wet, it takes much longer for it to dry over a syntethic insulator such as 3M’s Thinsulate™ fabrics. For the most part, these types of insulators are added as a liner to a outer shell and can be used in place of, or in addition to a sweater or pull over jacket. The third layer is the weather protection layer that is most commonly a lightweight shell, manufactured from nylon fabric. However, they can also be made from leather, wool or heavier grades of nylon, some which are virtually indestructible. Depending on the use and the types of conditions you are going to encounter, the shell should be breathable, windproof, waterproof and incorporate a hood. 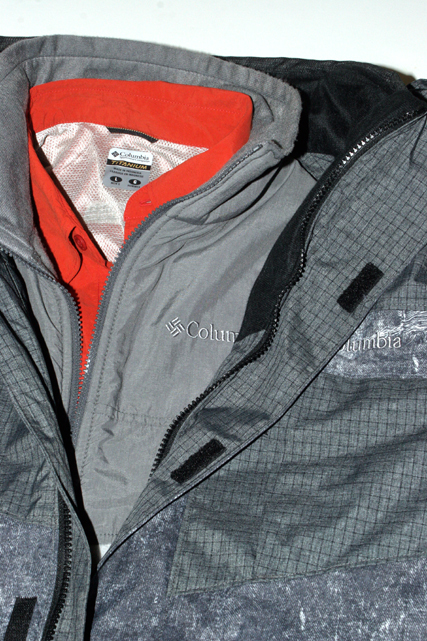 This Columbia Voltage II jacket is a perfect example of an insulating layer. It’s made from 100% brushed polyester fleece, has a water repellant layer, and is breathable. 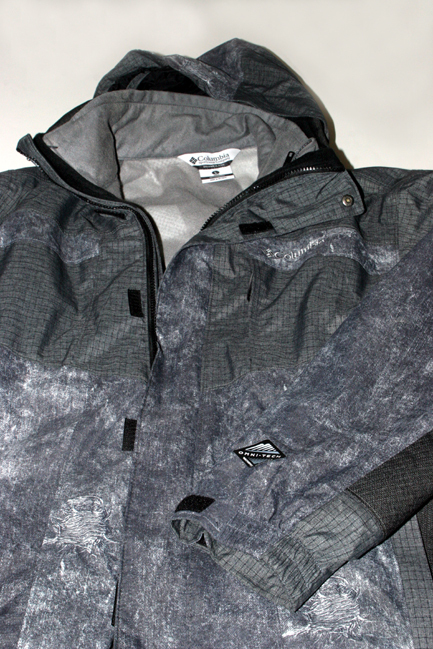 Many will have some kind of breathable, waterproof membrane such as Gortex, Omni-Tech™, or other. Again, it’s important to look for an appropriate shell that matches your outdoor activity. High activity outdoor sports such as snowboarding for example, will require a shell with more ventilation in key areas around the torso and armpits. Ice climbers will typically use a shell that also incorporates greater maneuverability, and backpackers also look for shells that utilize abraision resistant fabrics around the shoulders to prevent tears. Many shells also have additonal features such as glove retainers, pockets for ski goggles and places to hold and protect your electronic media. Others include larger zipper tabs for easy operation with gloves or even battery operated heaters. With an abundance of performance fabrics, styles and colors available, choosing the right outdoor clothing for your layering system will also make you look good on the slopes and trail, while keeping you comfortable in hot, cold and wet weather conditions. Shells come in a variety of styles. This Columbia Bugaboo Reskin parka is perfect for snowboarding and features its own zip-in fleece insulating liner that can be removed and worn separately. Depending on what your activitiy is, some base layers can be a shirt like this Columbia Powers Verticlal long sleeve. It features the company’s Omni Shield for water repallancy and the company’s Omni Shade that offers UPF 30 sun protection as well.